Fibre - the new 'public good'? For those of you who have decided fibre is the new 'public good' and should be paid for by the tax-payer, answer me this. So let's say it's going to take $4 billion to lay fibre to 1,000,000 homes. That's just 4 grand a home. If I got a call tomorrow from a salesperson trying to sell me fibre for $4,000 I would tell them quite firmly to piss off. Would you? So why are you happy for the government to use your money buying something you wouldn't fork out for privately? As usual with big government subsidies the majority end up paying for the benefit of a minority. Just like social welfare. But this is called corporate welfare. I wonder if Michael Cullen's mullings go something like this. There are 371,000 families receiving WFF tax credits. Not all of these families will have two voters but let's assume two thirds do have. So 616,000 potential Labour voters. Improving WFF would tend to increase the chances of these voters ticking Labour. Tops this group provides 26 percent of the vote. Then look at 65+ age group. Roughly half a million voters. Many will vote Labour because they have always voted Labour. Voting Labour is an act of tradition and faith. Why change the habit of a lifetime? Let's guess that half will tick Labour. That's another 10 percent. Then there are some 200,000 single and couple childless people receiving an accommodation supplement. That's 8 percent but could overlap significantly with the beneficiary vote and 65+ vote so call it 3. What about civil servants? 36,000. Good for another 1 percent. That's 43 percent best scenario. Risky. Some more bribery will soon be called for. ACT leader Rodney Hide questions John Key's plan to invest $1.5 billion in broadband. In keeping with the thinking that drove the creation of the Regulatory Responsibility Bill Rodney wants better definition of the problem, clearer definition of the policy and identification of the unintended consequences. Making no pretensions to knowledge about the telecommunications industry I cannot understand why private money isn't available for what is a apparently such a stupendous investment. It is not good enough for Key to argue that this is what other countries are doing and ergo it must be the most desirable solution. Key is rather condescending towards ACT suggesting he might need to sit down with Rodney and explain how the telecommunications sector works. Perhaps Rodney can return the favour and explain how a free economy operates. The following chart is a little misleading. While the employment rate of sole mothers has risen, clearly a good chunk are recorded as 'employed' while still dependent on a benefit. Around 74 percent of sole parents still rely on welfare. 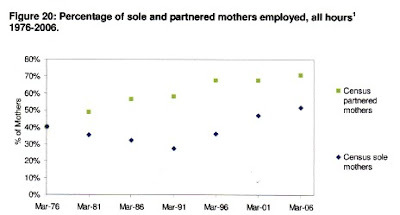 But it strikes me that at the very least the two lines should be reversed ie sole mothers should have a higher employment rate than partnered mothers. And they would have if we didn't have such generous state support. Sweden has no DPB equivalent and look at the results. In Sweden 73% of women work – only 3 percentage points below male employment rates; 97% of households with children have someone in work; more than 70% of the mothers with children and 80% of sole mothers have jobs. Sweden also has a much lower rate of teenage birth, which, as I have argued many times before, is a significant feeder into long-term DPB dependency. There must be a considerable row occurring among the left between the feminists who want women in the workplace and the feminists who want women to have unfettered access to state support for their lifestyle choices. If National form the next government the argument will be between conservatives who don't much care for the negative effects of the DPB and those who think a mother's place is in the home. There is another position. What's wrong with letting and expecting people to make and pay for their own choices? If you were ever in any doubt that National stands for the status quo and mere management of the current set up read this. Associate Professor of Medical Ethics at the University of Queensland and author of the study, Malcolm Parker, said that while he could not explain the support for euthanasia and sedation among certain specialists, palliative care workers were generally more religious and therefore less likely to assist suicide. "Their views are more likely to be based on religious views that it's immoral to help someone die and that bringing about someone's death is unacceptable." Last week some atheists railed against Christians who expressed their faith in the aftermath of Mangatepoto tragedy. Other people's faith is their business in my book. If it helps them, all well and good. But when it adversely affects other people's lives then atheists are on stronger grounds to object. Deciding to force people to linger on in enormous pain in their last days is exactly the sort of religious judgement that makes my blood boil. These people are essentially saying the individual does not own his own life. It is God's to control to the bitter end. The sooner we reopen the voluntary euthanasia debate the better. The Death With Dignity Bill is still in the ballot. Something I have been trying (with no success) to get to the bottom of is how widespread is the practice of unofficial fostering/adoption - or in Maoridom - whangai. Questions to MSD have been fruitless as they say information about the relationship between the caregiver and a dependent child is not necessarily recorded. Certainly an individual can claim a caregiver benefit if they have a child dependent on them, regardless of whether that child is their own. Again I believe this situation presents incentives which can lead to poor outcomes for the child or children involved. A variation on the theme of children as meal tickets if you like. The latest suspicious child death occurred in a fostering situation - one that was not a result of CYF intervention or a court order. Without legal standing. While whangai/adoption or fostering usually occur because the child's best interests have been considered, if the practice is happening for other reasons - monetary gain for instance - then the child's best interests could be decidedly ill-served. In this case we wait and see what unfolds. Here is something to consider. Cameron Bagrie, ANZ National bank Chief Economist, predicts unemployment will jump from 3.4 to 5 percent (BTW some US states are already experiencing over 6 percent). That will push up dole numbers. But it will also push up DPB numbers as families struggling to live on the unemployment benefit alone decide they would be better off financially, living apart (if not in actuality - on paper). That is another reason why we badly need to turn the DPB back into temporary and discretionary emergency assistance only. A repeat of what happened during the eighties must be warded off.